“Eating moments determine the state of mind throughout my day. I eat 2.5 times a day, so in my whole life, I will approximately have 82125 meals and spend 82125 hours just to eat. I would like to capture and cherish every eating moment I have in my life because eating is truly beautiful, inspiring, engaging, joyful, and sacred." This is a VR documentary of my daily eating ritual. 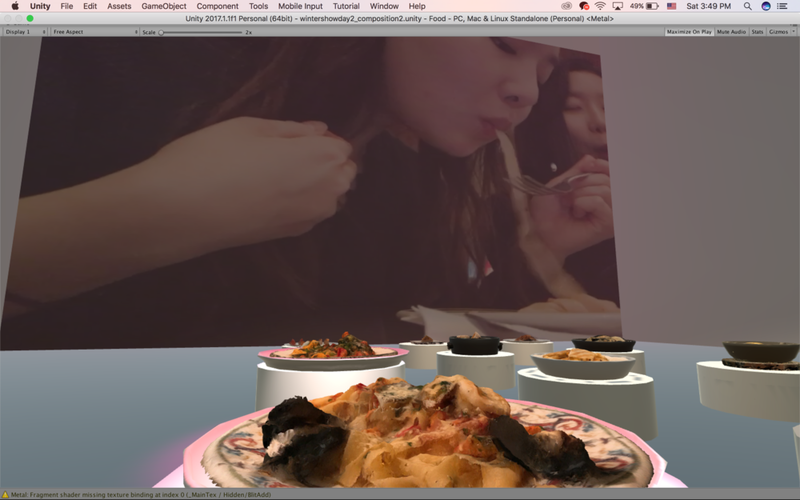 I display 3D scanned food from selected meals that I want to commemorate as artwork. I put them on white shelves within a white, cube-shaped virtual gallery space. If you stand right in front of each food and trigger it, my Mukbang (eating video)* of that food plays on the large front wall. Moreover, my narration describing the meal plays as well while the shelves of all the food from the same meal light up and rotate like the steps of a sacred ritual. I aim to show the genuine atmosphere and emotion of the actual eating experience by displaying the assets captured at those moments. *Mukbang (or muk-bang) is an online audiovisual broadcast in which a host eats large quantities of food while interacting with his or her audience. 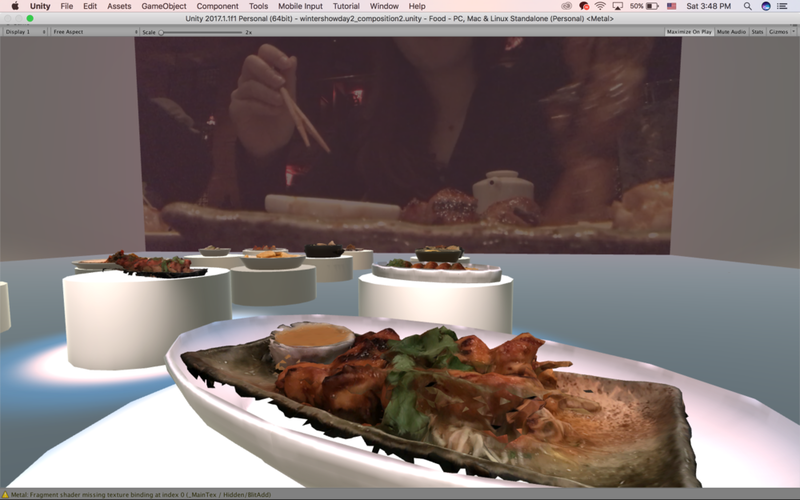 I used my photogrammetry skills to 3D-scan real foods that I had in each meal. Photogrammetry is the use of photography from 360 degrees in mapping to make 3D models. I used PhotoScan Pro to create the meshes and to map the texture of the 3D models and cleaned the meshes in Zbrush to make sure the models were shaped correctly. 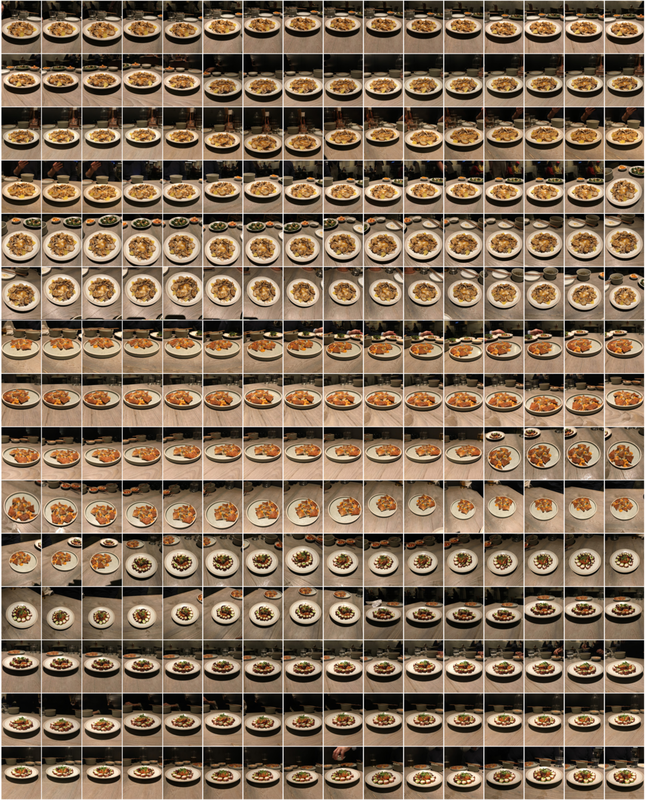 And.. look how many pictures I had to take to make 3D models of food. 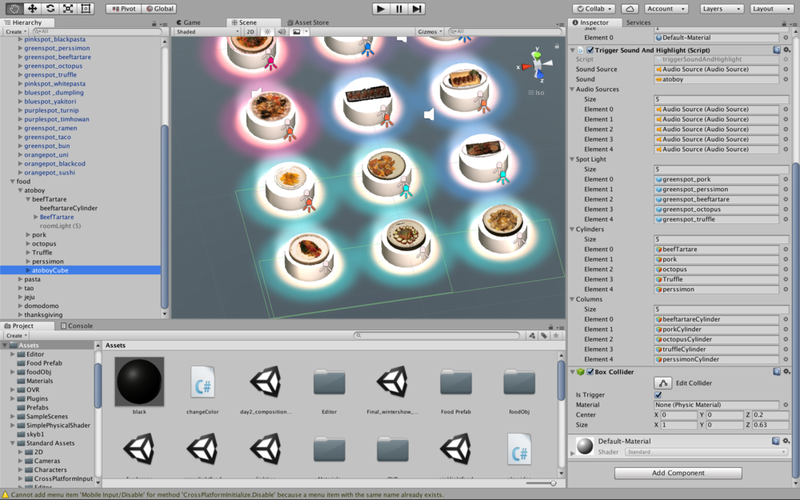 Here are some of many pictures for three dishes. I cleaned the bumpy meshes of the 3D models in Zbrush. I had to add and modify clay to make it smooth and realistic. I also decreased the polygon count to make the 3D models light-weight. Then I re-imported the modified meshes back into PhotoScan to add texture. I repeated this entire process until I obtained satisfactory results.